Tom Schiller conclusively summed up one of the cruellest of the Universes tricks with title of his often forgotten, strange and whimsical masterpiece. Nothing lasts forever. Whether Jane Foster was aware of this, or of Schiller’s tragically beautiful film when she assumed the mantle of Thor by lifting Mjolnir on the surface of the moon, is open for debate. On some level, she must have at least sensed it; some part of her must have known it to be true. She witnessed her former lover lose his identity and she picked up his burden, but whether or not she really knew, or believed it, in the beginning is immaterial or whether she thought she could possess the power of the Thunder for eternity is inconsequential. 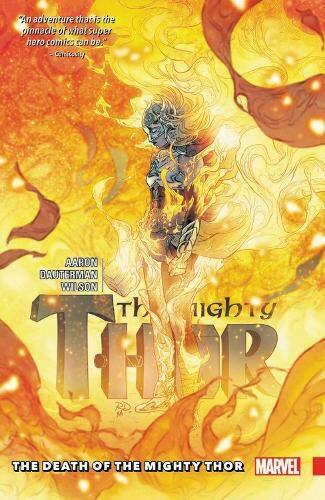 By the time Jane Foster, more commonly known as the Mighty Thor becomes locked in a desperate struggle to prevent Maleketh’s attempt to plunge all of the realms into an everlasting war, she is more than aware that her days as the God of Thunder are numbered. She knows she is dying, she knows that her cancer is terminal and she knows that it was the strain of sharing the power of the immortals that has hastened her demise. Magic, as Stephen Strange so eloquently reminds those who seek his help, is a costly venture and there is always a price to pay for its usage. Jane Foster knew this, and thought that the sacrifice that Mjolnir demanded of her was worth paying. As The Death of the Mighty Thor opens, the oncoming war of the Realms seems inevitable, and no matter what Thor and the Odinson do, it seems that nothing can prevent Maleketh’s long held plan from coming to fruition. As soon as they plaster over one crack in the Realms, another two open and the continual effort to try and hold back the forces of darkness finally takes its toll on the Mighty Thor. In an effort to force Odin to face his own inadequacy, Jane succumbs to her illness. Taken back to Earth, she is compelled to finally accept that the next time she becomes Thor will be the last and she will have to pay the debt that all men and women owe. Fate, being the cold hearted master of timing that it is makes her choice for her, as the Mangog arrives to punish all the gods for Odin’s sins. With Asgardia on the brink of collapse and the gods all but defeated, Jane Foster makes the only choice that she can. She summons the power of the Thunder, and flies into battle for the last time. Her decision made, she fights for Asgardia and guarantees herself the one thing that all of the gods ruled by Odin desire, her place in the Halls of Valhalla; where the souls of the brave and mighty dwell for all eternity.